Power Consumption - 18,2W (Access) ; 6,8W (HDD Hibernation). Noise Level - 19.0 dB(A). System Fan - 92x92mm x1. LAN Gigabit - X1. Weight - 1.25Kg. Size (HxWxD) -165 X 108 X 233.2 mm. External HDD Interface - USB 3.0 Port X 2, USB 2.0 Port X 1, SD Card Port X 1. 500GB SATA II. 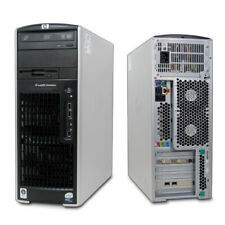 Dell HP IBM Workstations. HP Workstations. Dell HP IBM Servers. HP Proliant Servers. HP Proliant DL380 G5. HP Proliant DL380 G4. HP Proliant DL360 G5. Rams 16GB DDR2 RAM 667Mhz PC2-5300. Drives 500GB SATA II. Optical Drives DVD- Multiplayer. RAM 16GB DDR2 RAM 667Mhz PC2-5300. Optical Drives DVD- Multiplayer. Drives 160GB SATA II. Rams 32GB DDR2 RAM 667Mhz PC2-5300. Optical Drives DVD- Multiplayer. LOADED SC 822T-500RCB!!! Complete system. HP ProLiant DL380 G5 2u Rack server. 2 x Gigabit Ethernet. 1TB SATA 7.2K Hard Drive. Systemax Technologies Pty Ltd is a trusted supplier of servers, options, storage and networking products, server racks, high end workstations and much more to organisations throughout Australia. System RNDU4000. NETGEAR ReadyNAS Ultra4 6TB 6GB/s HDD Gigabit Network. Storage Capacity 6TB. Replicate and synchronize files between two ReadyNAS devices. Device Type: NAS Storgae System. Expand storage capacity as needed. HP ProLiant DL380 G5 2u Rack server. 8 x 2.5" Hot Plug SAS Drive Bays -NO DRIVES INCLUDED. 2 x Gigabit Ethernet. Dell OptiPlex 9010 Desktop PC. Dell OptiPlex 9010. HPE, Dell, IBM, SUN Servers. HP, Dell Workstations. Systemax Technologies Pty Ltd is a trusted supplier of servers, options, storage and networking products, server racks, high end workstations and much more to organisations throughout Australia. AMD Turion MT-34 64 desktop computer. AMD Turion 64 on the Desktop. AMD Turion MT-34 (socket 754) 1.8GHz. The basic principle is that you use the AMD Turion MT low power laptop chip on a desktop mainboard. 1TB SATA 7.2K Hard Drive. AMD A4 5300 3.40Ghz Dual-Core Processor. On the odd occasion when things do not go to plan, you can be rest assured that our after sales team is here to help! QUICK LINKS. If a hardware fault is diagnosed they will allocate a reference number and arrange for the goods to be collected. 466Mhz CPU. Compaq AlphaServer DS10 Server. 1 x Riverbed Steelhead 250H WAN Application Accelerator Appliance SHA-00250-HRiverbed Steelhead products accelerate application performance and data transfer over the wide area network (WAN), overcoming bandwidth and geographical limitations to improve productivity and enable global collaboration. Synology DS212 NAS in excellent condition, and in full working order. LM 85883 P: 7191 L: 51. $Synology DS212J 2TB NAS P/N: 53693 Comes with psu, power cable and network cable Synology DiskStation DS212j is designed to provide a solution of file storage and sharing with data protection for your home environment with low power consumption, quiet operation and reliability. Running on DiskStation Manager (DSM) operating system, it delivers ease of use and a variety of features. Multimedia Center at Home DS212j brings innovative and enjoyable multimedia entertainment to your home. Enjoy sound and sensation while enriching your life with personal online albums and blog services. Your social life just gets better. The iPad, iPhone and Android App, DS audio, allows DiskStation users to stream music stored on DiskStation with their mobile devices wherever Internet access is available. A Dedicated Peripheral Port permits a secure connection to external USB devices, including CAC smart card readers, fingerprint readers and face recognition devices. Patented emulation technology prevents Display Data Channel (DDC) signal leakage; and guards against signal attacks. Windows Remote Desktop Services CAL 2012 (1 User) - Multilanguage. All of our products are fully backed by manufacturer warranty. All of our products are fully backed by Australian manufacturer warranty. Manufacturer: LENOVO. Office Products. Printers & Scanners. We’re here to help. More about Warranties. LENOVO Windows Remote Desktop Services CAL 2012 (1 User) - Multilanguage Windows Remote Desktop Services CAL 2012 (1 User) - Multilanguage. Lenovo MS Win Remote Desktop Svcs Cal 2012 (5 Dev) 00Y6344. We know you’ll be keen to receive your order as quickly as possible. All of our products are fully backed by Australian manufacturer warranty. Lenovo MS Win Remote Desktop Svcs Cal 2012 (5 Dev) 00Y6344. Manufacturer: LENOVO. Office Products. Printers & Scanners. We’re here to help. More about Warranties. LENOVO Windows Remote Desktop Services CAL 2012 (5 Device) - Multilanguage Lenovo MS Win Remote Desktop Svcs Cal 2012 (5 Dev) 00Y6344. Lenovo MS Win Remote Desktop Svcs Cal 2012 (5 Dev) 00Y6344. HP Proliant DL380 G5 Server. Came from an office clearance, has no psu so unable to test. All internals seem to be intact apart from psu. Selling for spares/repair. Collection only from CH46 Wirral. Used Compaq Presario CQ5226UK tower computer. Pentium E5300 (W) 2.6 GHz (65W). Hard drive. 240 pin, DDR3 SDRAM. Speed supported. 4 GB (2 x 2 GB). Maximum allowed. Also have a firmware update CD from 2005, but not sure if it's for the DS10. I was going to use it as a web server, but never quite got around to it. $P/N: 458561-421 2 x Intel Xeon Quad Core X5460 3.16Ghz 16GB RAM 3 x 146GB SAS 10K Hdd (with caddies) DVD ROM 2U rackmount dual PSU 2x HP PCI-E Quad port 1 Gb network adaptor Lunix Mint Installed. Good condition. Comes without any accessories. HP ProLiant DL380 G5 2u Rack server. 8 x 2.5" Hot Plug SAS Drive Bays -NO DRIVES INCLUDED. 2 x Gigabit Ethernet. DVD-ROM Drive. 2 x 72Gb 15k SAS Hard Drives. HP ProLiant DL380 G5 2u Rack server. 2 x Quad-Core XEON E5440 2.83Ghz Processor. Pair of Rack Mount Rails. 2 x Power Supplies.